The 2017 season was a memorable one for left-handed pitching prospect Jake Fishman. Fishman’s memorable year began with a brief stint with the big club in spring training. Obviously, this moment was very surreal for the young lefty, who was only experiencing spring camp for the first time. 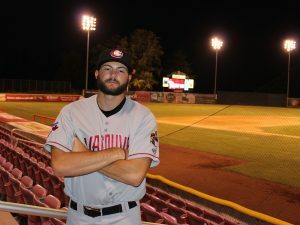 This opportunity was a tremendous one for Fishman, as he walked away from it with a better understanding of what he needs to do to play in the major leagues on a consistent basis. With this in mind, Fishman is focused on becoming more consistent with his sinking fastball during the off-season. His velocity hasn’t been an issue yet, as Fishman sported an impressive 1.01 WHIP in 30 2/3 innings pitched among three levels. But despite the success he had last season, Fishman noticed a change in the talent when he reached low-A Lansing in August. Luckily, challenges are something that fires Fishman up every time he walks out to the mound from the bullpen. There’s no question why fans are so high on Jake Fishman’s future in the Blue Jays organization.